â€˜Disneyficationâ€™ â€“ Weekend Wide Gameâ€™s 12th North event saw SC&T Rovers unravel the truth and lack of originality that Disney use in their movies, from activities in the worlds of Baghdad (Aladdin) and Â Greece (Hercules), through to Neverland (Peter Pan) and Wonderland (Alice in Wonderland). 201 Scouts in 38 Patrols competed throughout â€˜Disneyficationâ€™, being chased by Goons such as Efreet, the Amazons, the Lost Boys and Tweedle Dee & Tweedle Dum whilst completing activities such as the Wendy Bombing, riding the Magic Carpet, Haddock JoustingÂ and defeating the evil Hydra. With quite a leeway against Mickey the Merciless, it was found that the opposition, Pixar with their originality and being highly against the â€˜Cease and Desist Orderâ€™ for character worlds, won the popularity contest for the majority of patrols. Greece, based upon Hercules, tested an individualâ€™s skill. Wonderland, centred upon Alice, required logical thoughts. Baghdad, focussing on Aladdin, rewarded stealth and cunningness. Neverland, constructed around Peter Pan, challenged a patrolâ€™s ability to use teamwork. The results for WWG XII â€“ Disneyfication are below. 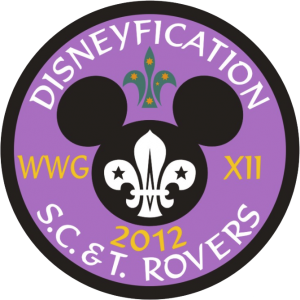 The SC&T Rovers would once again like to extend a heartfelt â€œthanksâ€ to all the Venturers and Rovers who assisted throughout the weekend.